Dogs need mental stimulation in addition to physical activity, and this pack will give your dog both! 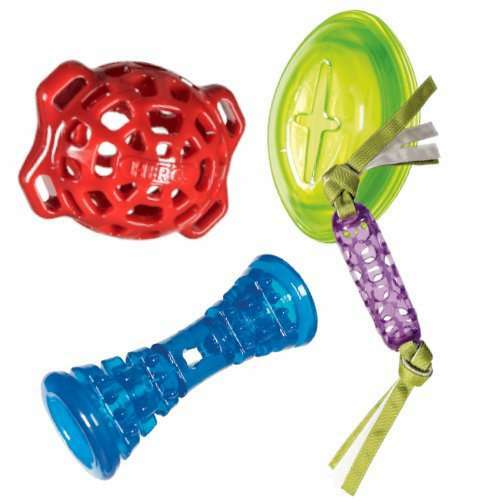 Rotate these toys every few days and switch out the treats inside to provide new challenges and give your dog’s brain a workout! 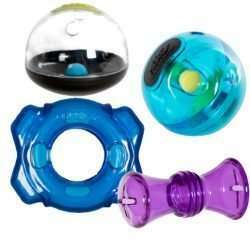 The Treat Dispensing Pack includes: Holi Treat Ball – The nubs on this ball cause it to bounce erratically as your dog pushes it around attempting to free treats from the holes. 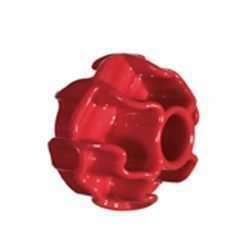 Soft Rubber Football – Insert treats inside this ball and watch your dog attempt to get them out of the holes in the sides. Great for fetch too! 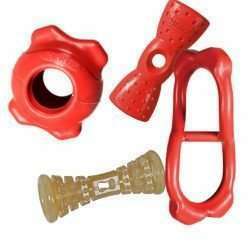 Soft Rubber Treat Bone – This bone has plenty of grooves and holes to hide treats or spreads in. The nubs also provide great gum cleaning for your pup! Soft Rubber Baton – The enlogated shape of this toy make it a perfect bully stick or bone holder! Put smaller treats fully inside to give your dog more of a challenge. The nylon rope tassels make this toy great for fetch and tug of war.